With over a century's history, the Best Western Plus Hotel Massena Nice welcomes guests in a warm and friendly atmosphere. A stay at this hotel takes you to the heart of Nice city center and Place Massena, just 3 minutes from the beaches and the Promenade des Anglais. The 110 guest rooms and suites each have a range of different categories of rooms to discover. All the rooms are equipped with high-quality luxury bedding, free Wi-Fi, and flat-screen TVs. 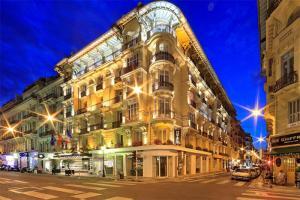 This hotel is about a 10 minute drive from Nice Airport, and a 15 minute walk to Nice City Station.